One Mom's Moxie: Loopeez Review and Giveaway!!! Here it is my very first review and giveaway! Just a week after starting this blog and working on getting a good amount of followers I contacted Loopeez to possibly do a review and giveaway. I was so excited to hear back from Loopeez, they wanted me to do a review and host a giveaway! I am so honored! 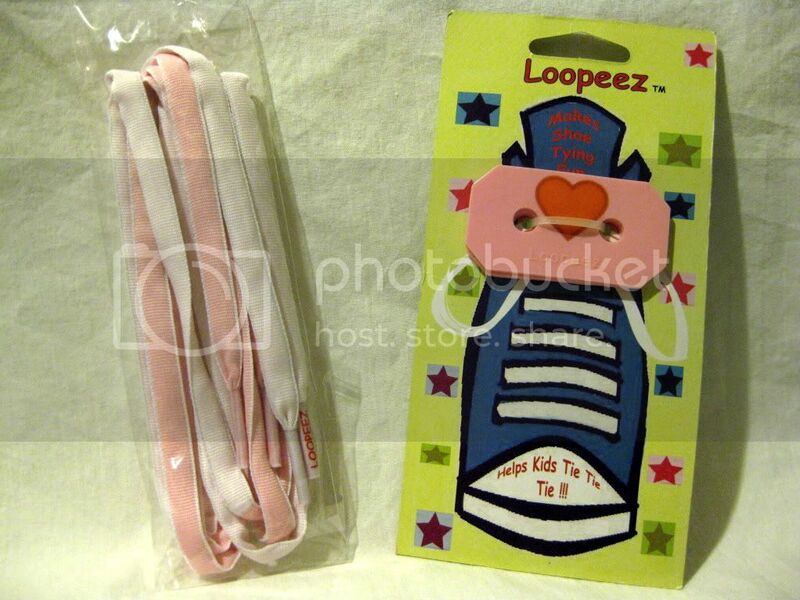 Loopeez are a educational and therapeutic shoe tying aide, something every child will need to learn at some point. Teaching a child how to tie shoe laces can be a somewhat frustrating, not only for you but for the child as well. Children want to learn things quickly, but they are still improving their eye and hand coordination between the ages of five to seven. With the help of Loopeez children can find tying their own shoes fun, and parents will be happy knowing their children are learning an everyday skill. Another great benefit of Loopeez is the therapeutic or special needs use of them. They are not just for children, an adult going through rehabilitation can benefit greatly from using Loopeez. Any person with special needs will find that Loopeez can help them and make shoe tying a breeze. I found this to be true for myself. My hands will hurt and I will sometimes have a problem tying my own shoes, but when I tried Loopeez it was so easy I couldn't believe it, I tied and untied several times. Bella quickly tied her own shoes with no problems and no arguing with me! I love Loopeez! Not only is Bella able to tie her own shoes, but they stay tied! The material used to make Loopeez seems to keep the laces from becoming untied easily. I really find Loopeez to be helpful and easy to use for anyone! Here are some photos of Bella using Loopeez. The first three photos I took, and then Bella wanted one from her point of view in the last photo. Please go see for yourself the many choices that the Loopeez website has to offer at www. Loopeez.com. Purchasing Loopeez has been made easy using PayPal. You can also keep up with Loopeez by liking their Facebook at Facebook Loopeez. And now for the giveaway! Loopeez is giving away a Loopeez of your choice as well as Loopeez laces of your choice too! By entering below you are agreeing that everything you enter is true and correct. Thank you for following olahmomma.com. Following back your lovely blog. I am also inviting you to add your blog at Momma's Lounge ( http://olahmomma.com/momlounge ) where you meet more mom bloggers; shout away; add your giveaways and/or business links; and get featured by sharing your crafts, recipes and interesting musings. Good luck with your first giveaway. Good Luck, and Thanks for the giveaway! I like the skull and crossbones. My son has Autism and has such a hard time tying his shoes. I think this would really help him. These are great! I have a 6 yr old son who just does NOT want to learn to tie his shoes. These might actually help him! Oh My Gosh $48.51!?! Thanks Sheer Cover! !